TBvision’s static analysis capabilities simplify the enforcement of coding standards across your organisation, improving the overall consistency and quality of the code. TBvision helps your team develop and enforce the coding standard that is right for you, from in-house best practices and guidelines, to industry coding standards, or a combination of in-house and industry standards. Examples of supported standards include MISRA C, MISRA C++, AUTOSAR C++, CERT C, CERT C++, CERT Java, and Netrino C.
A common way to improve the consistency, maintainability, and overall quality of code is to assess the code against industry- or company-defined standards so that deficiencies can be quickly identified and corrected. While this is often achieved through manual peer reviews, the process can be painful and time-consuming, especially in large projects. If your team is struggling to maintain code quality and consistency, it might be time to take a more rigorous approach. For many companies, coding standards compliance usually starts either with guidelines and rules developed in-house or with widely accepted rules from standards such as MISRA or CERT. Often in-house rules are combined with industry-standard rules to form a corporate standard that is appropriate for the needs of the organisation. 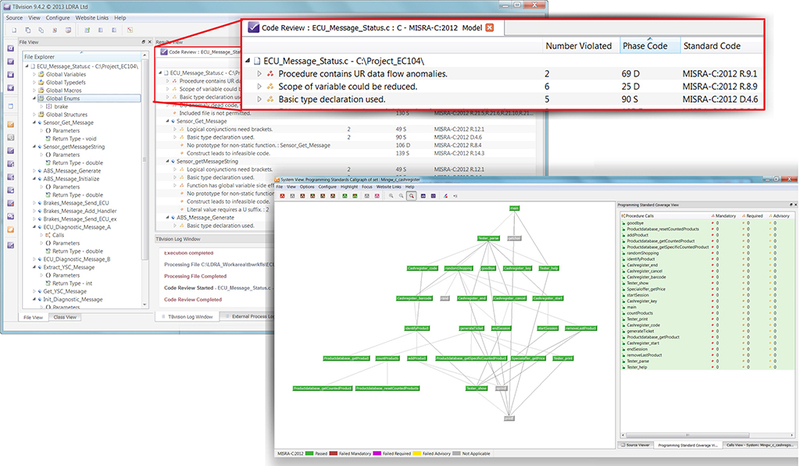 With LDRA’s code visualisation, you can identify exactly where the source code deviates from the standard so it can be rapidly addressed. While many rules checking tools are created equally (because they’re based on the same commercial third-party parsing engine), LDRA’s standards compliance tools offer significant advantages. We have complete control over our parsing technology, which means we can quickly adapt to variations in languages and language constructs. And with our long involvement in standards organisations such as MISRA, we’re able to respond rapidly with updated rules checking as new standards are released. Our coding standards compliance tools let you combine standards and define appropriate rule subsets, select individual rules, and add your own. Within the tool, you can easily check for coding standards compliance to any single standard or combination of standards or subsets. And you can check compliance of a single code base against multiple standards to compare how the code fulfills each one and see what would be required to adapt the code to conform to it.